Business users that are considering Windows 8 for the first time should look closely at their existing IT platforms and any legacy systems they are running. Windows 8 offers a plethora of features – none more so than its touch interface – but for business users, the core day-to-day operations of their enterprises may not need these frills. A robust and stable operating system they can rely on to run their mission critical systems should be the guiding principle behind any upgrade to Windows 8. For businesses the information that they collect, store and analyse is their most precious commodity. In the past, protecting this data required the use of several third-party applications. With Windows 8, BitLocker Drive Encryption (BDE) has evolved to become a superb encryption system that's built right into the operating system. The security enhancements that Windows now contains offer a core reason to upgrade. And for businesses that want to move their security to an even more secure plain, Windows 8 also has secure boot that locks the installed Windows 8 signature to UEFI (Unified Extensible Firmware Interface) chip. Clearly having a similar user interface on your business' desktop PCs, tablets and even smartphones can offer a level of integration that hasn't been possible before. Microsoft's Surface is the new kid on the tablet block, and will take some time to compete with the iPad and the myriad of Android powered tablets available, but businesses looking to refresh their PCs, and embrace more mobile working will see Windows 8 as an easy transition. The introduction of the Dell Latitude 7000 for instance that offers highly compact mobile computing is a very attractive package with Windows 8. With the touch interface quickly becoming ubiquitous, business owners will eventually move all of their applications to this kind of interface. As a business operating system, Windows 8 wins because it can be quickly transformed from a touch-based operating system to one that uses a keyboard and mouse. This flexibility hasn't been available in the past. Small business owners will instantly see how this level of flexibility can help their enterprises. The Windows 8 To Go app is very useful, as it enables Windows 8 features to be used on any PC via the USB-based app, and add in SkyDrive for online storage, and small businesses can take a quantum leap forward in efficiency by adopting Windows 8. 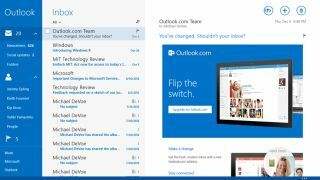 As TechRadar concluded in our review: "The cloud integration in Windows 8 is a game changer." Windows 8 is also compatible with all of your business' hardware making the transition seamless to achieve. Businesses that want to stay ahead of the technology curve Windows 8 is a different experience to Windows XP or 7 that have become highly familiar. The move to more touch interfaces is a clear influence on Windows 8, but business owners that have yet to make full use of touch-enabled devices can make their move instantly by adopting Windows 8, as it can offer a unified environment across desktop PCs and tablets. Small businesses of course have a background with Windows. Having moved through several iterations of the operating system, there is a natural affinity for Windows 8. With its enhanced security in particular, Windows as a platform for business has come of age.